Whisk together the marinade ingredients in a small bowl. Place the chicken in a large ziplock bag and add the marinade. Toss everything around in the bag to coat all the chicken pieces. 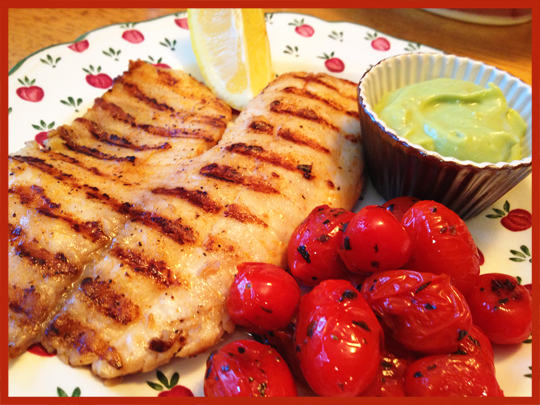 Marinade for at least 30 minutes and up to two hours. Grill the chicken using the 7-6-5 method: seven minutes on the first side, flip the pieces over, grill for 6 more minutes. 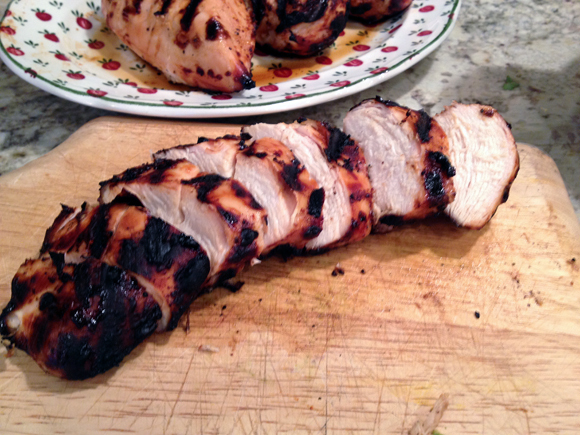 Turn the grill off without opening the lid, and let the chicken stay inside for 5 minutes. Remove from the grill, let the meat rest for 5 to 10 minutes slightly tented with aluminum foil, slice and serve. Use a spiralizer or a mandolin fitted with a julienne blade and cut the zucchini into very thin, spaghetti-like strands. Do the same for the cucumber, but place it over paper towels to drain excess liquid. To make it easier to serve, trim the strands cutting with scissors or a sharp knife, so that they are about 8 inches long. Place both veggies in a large serving bowl. Reserve. In a small bowl, make a quick emulsion whisking the olive oil and lemon juice, a touch of salt and pepper. When it’s all emulsified, add the lemon zest. 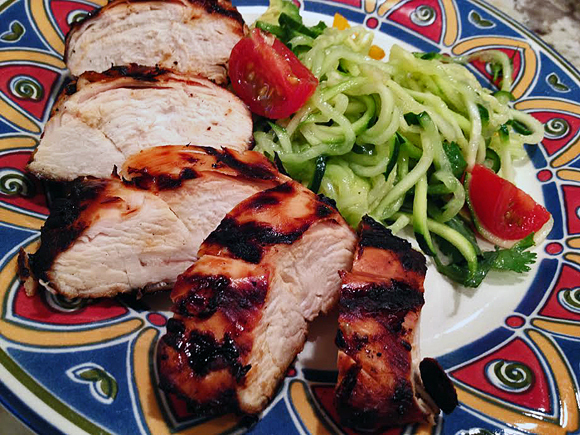 Drizzle the dressing all over the strands of zucchini, and toss to coat. Allow it to sit at room temperature for 5 to 10 minutes. Add the avocado pieces, the tomatoes, toss gently to combine. Sprinkle cilantro, adjust seasoning, and serve. Comments: First, my apologies for being unable to give immediate credit to the grilled chicken marinade. I found it in the internet, thought I had bookmarked it, but instead I did a cut and paste of the ingredients and sent to myself by email. (Palm hits the forehead!) Since I clear my bookmark history every week, no luck tracking it down. (Head shake in disbelief…) Hopefully a lesson was learned. However, thanks to one of my dear readers, I could retrieve the source, and correct my mistake. It came from Happy Food Happy Home. Cute name for a blog… 😉 Thank you, Nan, for finding the source for me. The salad. Of course, the spiralizer makes it super fun and interesting, but taste should come first, and in this category we also have a winner. However, depending on how watery your cucumber might be, you could run into problems. One way around it would be spiralizing only the zucchini and adding the cucumber in small pieces together with the avocado & tomatoes. You can salt them very lightly and wait for a few minutes until the salt draws most of the excessive liquid out. 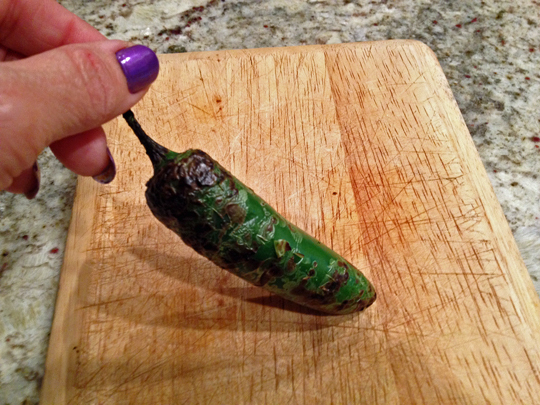 A brief rinse, a brief encounter with paper towels, and voilà: perfect cucumber! This is harder to do with the strands, so keep this in mind if you try this salad. The husband verdict: you can make this recipe ANYTIME. It is awesome! 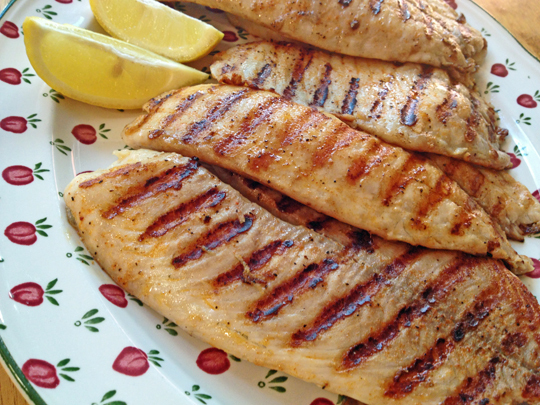 I never thought of grilling tilapia filets because they are too delicate, but pan-grilling worked so well that I can see it as my method of choice from now on. Normally I would either pan fry them after coating with flour, or follow a lighter route, baking in the oven. However, when the weather outside is the way I like it (mid to high 90’s yeaaaaaah!) I rather not turn our oven on. The inspiration for this meal came from Cooking Light magazine, but I definitely took off in my own direction. Mix the olive oil with the smoked paprika in a small bowl. Lay the filets on parchment paper, season lightly with salt and pepper. 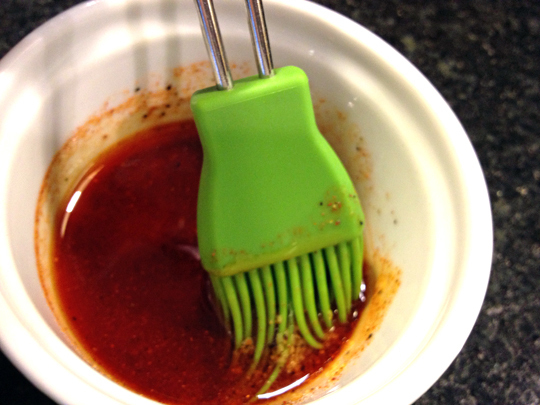 Brush both sides with the smoked paprika oil. Heat a grill pan, when hot spray it lightly with oil. Add the filets and cook 2 minutes per side or until done (they should flake easily and have nice grill marks). For the avocado cream, blend all ingredients except the lime juice in a small food processor or blender, until very smooth. 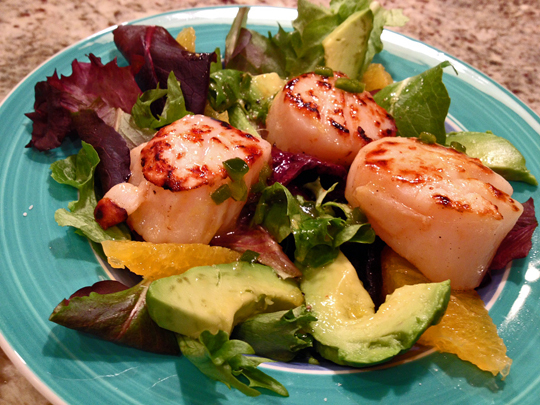 Taste and add lime juice for a nice balance of flavor, as the orange juice tends to make it a little sweet. If you want a more runny consistency, add a little water (or any of the juices according to your taste). Serve cold or even chilled. Before I leave you… Since I’m on the subject of fish dinners, Kelly from Inspired Edibles recently blogged on a great recipe for sole filets. After seasoning the filets in a lime-chili marinade, she coated them with quinoa flakes and baked in the oven. Click here to read her post about it. I pinned her version to try once the weather cools down a little. Sounds absolutely delicious! Sometimes (quite often, I’m afraid) I have a recipe on my list of things to do ASAP and there it sits for a year or five. But every once in a while the exact opposite happens: I see a recipe, fall in love, and make it right away. 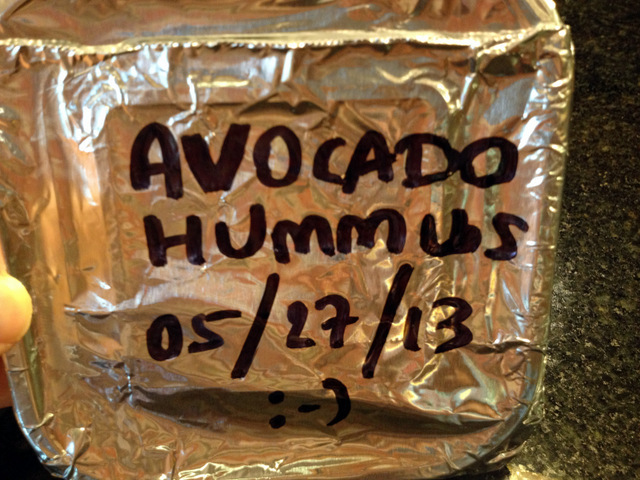 This avocado hummus showed up on my screen during the last Secret Recipe Reveal Day, which fell exactly on Memorial Day. Maybe having the day off helped, but the truth is that I saw the recipe mid-morning, and made it at 3pm. How about that for efficiency? In a food processor add all the ingredients and process. Add more water if you would like it thinner. 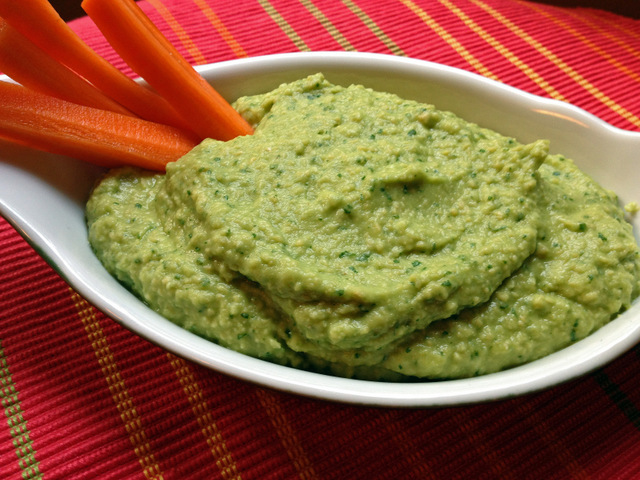 This hummus recipe makes quite a large amount, so I could save some for a later, happy day! ONE YEAR AGO: Moving is not for sissies! THREE YEARS AGO: Pizza! Pizza! We have little time to cook, but we’re always seeking something wonderful. Avocados meet us in the middle. Especially the rich, creamy Hass and Calavo avocados, from California and Mexico. Here are three quick and easy ways to enjoy them! 1. Avocado Appetizer. Hungry for something delicious and healthy? My aunt Millie showed me this one. If the avocado’s just right, then it’s hard to top. Acquire a perfectly ripe avocado. How can you tell? Squeeze the avocado…it should be very firm but not hard, soft enough so that it yields to moderate pressure. Knock out the stem-plug and look for a green (not brown!) core. This is my Americanized rip-off of the continental classic. Cut the the tomatoes, cheese and avocados into slices or chunks; shred or chiffonade the basil and let it sit in the oil for 5 or 10 minutes. Assemble the components on a salad plate and drizzle-spread the basil-oil mixture over them, using a fork to help distribute the basil. Season with salt and pepper, VOILA! It’s a little time consuming to prepare all the ingredients, but worth the effort. Note that I’ve pressed a garlic clove into a couple of tablespoons of olive oil: use just the oil for a milder garlic flavor, or throw it all in for garlic lovers. We also discovered, on a day when the avocados ran short, that the other components together make an outstanding fresh salsa!